There has never been a better time for farmers to get a win than now. The online submission process is quick and easy and could take less than ten minutes. Question two is the critical one and submitters can choose whether the carbon zero bill should just apply to CO2 emissions or should include methane and nitrous oxide. This is the best opportunity farmers have ever had to make their opinions known and get methane emissions at least, removed from the scope of this bill. If nitrous oxide emissions are removed as well then so much the better. 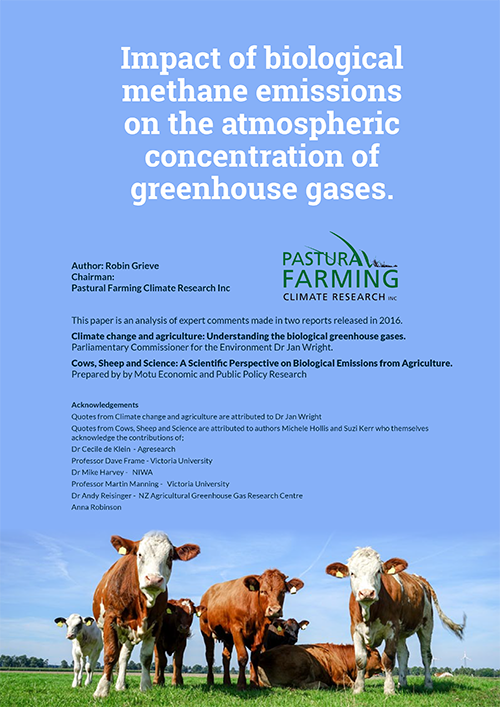 Including methane emissions in climate change policy and assigning them these bogus global warming properties has been a great injustice and now farmers can do something about it, by making their own submission. It is a ten minute job that will be the most productive ten minutes any farmer has ever spent. The farmers have the most to lose with this bill and so should be the most motivated to do it. Their submissions should swamp all others. I urge every one of you to make a submission, even two or three if you have spouses or farm managers and staff. Every individual can do one and while you can write comments and take a more considered approach if you want, the most important thing is to click the CO2 option for question 2. There have been about 4000 submissions received so far, there are more than 4000 farmers in NZ. The option has been given us, this is a numbers game so for your own sakes spend the ten minutes. In the ten years we have been fighting this there has never been a better opportunity to bank a win. We are now in a position where I can confidently state that the only way methane will be included in the legislation is if the farmers in NZ can’t be bothered spending ten minutes to save themselves. Please pass this on to your friends and neighbours as well.